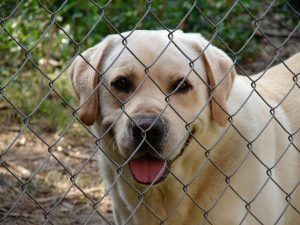 Invisible fence, electric fence or wireless fence are all considered the same type of fence for your dog, there will just be a few variances between them. 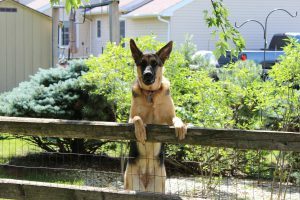 If you are considering getting an invisible fence for dogs, this article will provide you with information for you to make the decision if this is the best dog fence for your situation, your yard type and your dog’s personality. Invisible fence pros and cons to help you decide if it is best for you. I will provide you with information on approximate costs, DYI installation or professional installation and the different types that are available. Along with pros and cons of the invisible fence so you can make an educated decision before you proceed. Keep reading to learn more. You will have to choose between either a perimeter type system (wireless) or a buried wire system. I will explain both of these in a later section. You will have a transmitter device either located in your garage or your home. 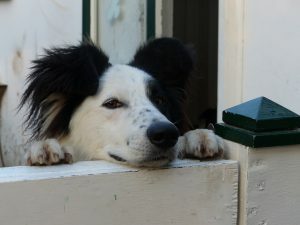 When your dog approaches the boundary that you have established, the transponder will send an audio alert, static warning or a combination of both to your dog’s receiver collar. Most systems will have different levels and different combinations that you can set for your dog. There are different amounts of electric force the collar will receive depending on how you set up the system. You will receive an instruction booklet that gives recommendations for dogs based on their weight. It is best if you experiment with the system to make sure to only give enough electric shock to contain your dog, but to keep your dog happy as well. I would also suggest testing the system on yourself. Hold the collar in your hand while holding it over the boundary line. What you should feel is an irritating sensation, but not a painful or shocking pain. The electric charge should be set up so it is similar to a splash of water on the face. Enough to surprise your dog and stop their movement forward. It should never be set up to hurt your dog. Perimeter Fence Or Wireless Fence – This type of fence is the least expense and the easiest and quickest to install. You basically just plug it in. The transmitter is the center of what the perimeter will be. It will create an invisible circle out from the transmitter. You determine the range. If you determine that 500 feet is your range, it will give your dog 500 feet in every direction from the transmitter. There are perimeter fences that also allow you to do other than circle shapes, but the circle is the most common, and you will want to check what shapes are available before you purchase a system. This system is much more labor intensive and more costly, but you are able to include your entire yard if that is what you want to do, and place the wiring wherever you want, including blocking your dog off from landscape areas or gardens if that is what you decide. An Invisible Fence/Collar Package will cost between $100 – $400 not including installation and depending on size. Most of them will be able to cover 1/4 acre to 1/2 acre. They will also have additional wiring that you can purchase if you need to increase the area of coverage. This pricing is for doing the work yourself. Additional collars can also be purchased to include multiple dogs. According to Home Advisor, the National Average to have the invisible fence installed by a professional is approximately $1160. Pricing will vary based off of the area that you want to cover, but this will give you an idea of the expense involved in having the invisible fence installed. You will want to check how many levels of shock that the product you are looking at has available. This will vary between different packages. If you have a stubborn or strong willed dog, you might need more levels available to customize it for your dog. Battery Backup Feature. This is not a standard feature, but one I would recommend. It is a good safety feature if you forget to recharge the battery on your dog’s collar. Shaping of the boundaries. Some systems only allow you to have certain shapes. Commonly it is a circle, but square and oval is also available, and some will allow you to create different shapes. Just like everything, there are some pros and some cons to using invisible fencing. I want to share both with you, to help you make a decision that is best for your situation and your dog. An invisible fence doesn’t effect the look of your yard. It doesn’t block your line of site and keeps everything open. It provides safety for your dog, but allows your dog to have freedom. Many neighborhoods prohibit fences or have restrictions on the type of fences that are allowed. Invisible fences don’t fit in those categories. An invisible fence is considerably less expensive than a regular fence. Invisible fences can work on any terrain, including wooded areas, hilly spots and through water. Convenient. It can be done more quickly and easier. More reliable if you have a dog that tends to climb over fences or dig underneath fences. Must check batteries regularly and recharge your dog’s collar. Dead batteries will provide your dog no protection from escaping. Other animals can get in your yard, which doesn’t provide any protection for your dog if you live in an area where there are coyotes or protection from other dogs coming in your yard and attacking your dog. Wireless fences will not work around metal. This includes steel or aluminum siding or metal roofing. If you go with the buried wire system, a cut wire with provide your dog an area to escape through. Re-entry or locked out. 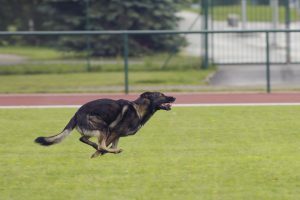 If your dog decides to go through the fence because he is chasing something or frighten by thunder or fireworks, they are locked out of getting back in the yard unless they are willing to get shocked again. If your dog does break out, they are more willing to do it again and just endure the shock. Most vets recommend not using an invisible fence on a dog younger than 6 – 8 months old. You will need to train your dog with the invisible fence. This should be done with flags to mark off the area that the invisible fence is located. I would suggest starting at a low setting to begin with and include the vibration on/audio function. You want to get to a point where your dog realizes that they need to stop when they get the vibration or the audio sound instead having your dog get the shock. This will take quite a bit of time training. Do not leave your dog unattended in the yard until they have an understanding of the invisible fence. 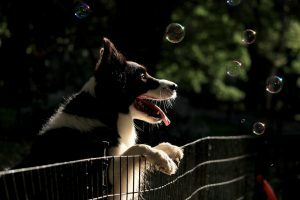 Most companies that sell DIY wired dog fences will provide support and thorough instructions for properly training your dog for using an invisible fence. Install the invisible fence 10 – 30 feet from the road to help your dog from becoming aggressive to close people passing by or other dogs. Many believe that a dog will relate the shock to a form of punishment. 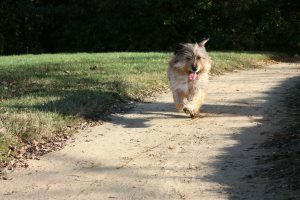 If they run up to greet someone or another dog and they get shocked, they can associate the person or dog with the pain. A friendly dog can become agitated or fearful because of this. To give you a rough estimate of how pricing of invisible fences compared to other fences, here are a couple of examples. This pricing is based off of a 1/4 – 1/2 acre lot. Chain Link Fence – 4′ high costs $1500 – $3000 if you install it yourself and a professionally installed fence costs $4000 – $7500. Wooden Fence – Ranch Style cost $1500 – $4500 for you to install yourself and a professionally installed fence costs $5000 – $15,000. If you decide going with an invisible fence is the best choice for your situation and you are going to do the job yourself, here are 3 that I recommend as good choices for you. You can order directly from Amazon right here. It is possible to install your own invisible fence, and supplies offer support if you have questions about installing an invisible fence. PetSafe Fee To Roam Wireless Dog & Cat Containment – Amazon under $300. Standard fence kit includes 20 gauge high tensile boundary wire with heavy protective jacket, digital transmitter, collar receiver with battery, training flags and splice kits. Available to upgrade to ProGrade which includes 14 gauge heavy-duty boundary wire, 16 gauge twisted wire, surge protector, 10 year warranty on electronics and lifetime warranty on fence wire. 1000′ of 20 gauge boundary wire and 100 flags to contain up to 1 1/3 acres of land. Waterproof collar receiver has tone and vibration as dog approaches the boundary and static correction levels 1 – 4. Can be expanded for unlimited number of dogs. Operating guide with training tips. I have mixed feelings on using an invisible fence for dogs and what is the best dog fence. What I wanted to do is supply you with the information you need for you to make your own personal decision if you think the invisible fence is the best way to protect your dog. The invisible fence pros and cons should help deciding if you want to go this route. I do believe that anything you can do to protect your dog from running in the road is a good thing. And for some people, the invisible fence might be the only option that they have due to neighborhood regulations or budgeting constraints. If that is the case, I am happy you are doing something to help protect your dog. The area where I have mixed feelings is first, shocking my dog. I have a hard time with taking away my dog’s confidence, and that might be the case with an invisible fence. The other area I have a concern with is if my dog does get out of the boundary I have established for them, they can’t get back in without getting shocked again. I can’t imagine them wanting to cross over the line again once they are free. And lastly, I have always had a problem with the fact that I walk my dog daily and I realize that I can remove my dog’s transmitter collar to take him for a walk, but it seems that it is hard for them to understand why some times it is OK to go through the boundary and why sometimes they could receive a shock by getting near the boundary. Please leave questions or comments below. I am very interested in hearing from others who use an invisible fence as to your thoughts and also from others that have a problem with the invisible fence. Both type of comments are very welcome. Let’s keep our dogs safe. Some of the links within this post are affiliate links of which I may receive a small compensation from sales of certain items. Mercy thanks for reading and I am glad you found the article helpful. Please do refer your friend to my site. If she has questions about dogs, I am happy to help.